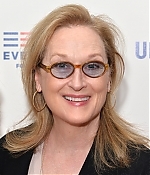 Yesterday, Meryl Streep has been among the guests at EPIX’ New York premiere of “Under the Gun”. The documentary gives a candid look at the aftermath of the Sandy Hook massacre. The tragic event took place on December 14, 2012 where 20 children were murdered at their school by a resentful, gun-obsessed shooter. The terrible incident was the deadliest mass shooting at a high school in U.S. history. The shooting prompted renewed debate about gun control in the United States but still no changes in American federal gun laws have been made.